The Offecct Prize was established in 2010 in order to reward a young promising architectural student at KTH School of Architecture in Stockholm, Sweden, in Offecct’s ambition to promote the next generation of architects. In 20 years Offecct has grown to become a major furniture manufacturer with high design ambitions, which is evident in the many international design awards that Offecct has received. Offecct works closely with architects both as designers and as clients, and sees the Offecct Prize as a way to honor good architecture. 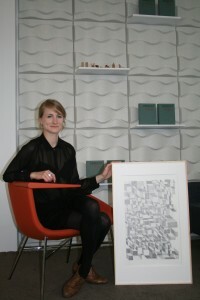 Offecct has the pleasure to present that the winner of the Offecct Prize 2013 is Maja Säfström with the project “100 Days of Drawings.” Säfström’s starting point in this project was to create “frames for creativity” in the doing rather than in the thinking. 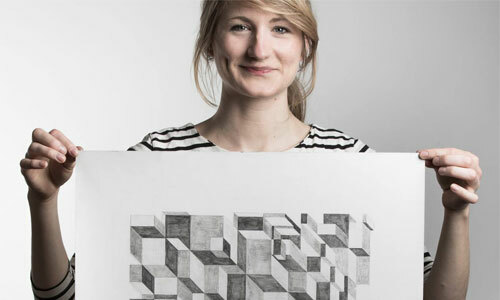 This resulted in a daily production of 100 abstract drawings. The drawings have been an investigation of when, how and why we experience depth in images. These questions sparked a curiosity about the fascinating relationship between two-dimensional pictures and our experience of three-dimensional spatiality and architecture. The motivation of the Jury:“In a time when architecture becomes increasingly digital, more and more rational and calculated, 100 days of drawings risk to appear as an anachronism. But no. One hundred carefully produced drawings, one for each day during the exam period, prove to be more important than any computer generated full scale model and illustrate with force the significance of sometimes looking back in order to look ahead. The analog tools have sharpened both the idea as well as the expression and the drawings radiate of the hands’ revived desire to explore. The result is a wonder of retained consistency, well captured in the typewriter font typical for architectural exhibitions, simply framed pencil drawings and the traditional drawing cabinets that escalate against an exposé of architectural representations throughout history. The next step, if the jury may decide, would be a three dimensional counterpart: 100 days of buildings.”Maja Säfström has studied at the KTH School of Architecture in Stockholm. She has also worked at an architectural firm in Shanghai. After the exam Säfström has returned to her own firm, Arkitekturfabriken.All the nominated projects are on display in Offecct’s showroom at Torsgatan 13, Stockholm, between June 12 and August 31 (closed between July 15 and August 4).